September 28, 2017: Two performances added to the Schedule page. July 7, 2015: Two recent acquisitions, a prewar tack-decorated snare drum and an original Civil War period clairon bugle, are now posted on the Instruments page; also updates added to the Schedule page. 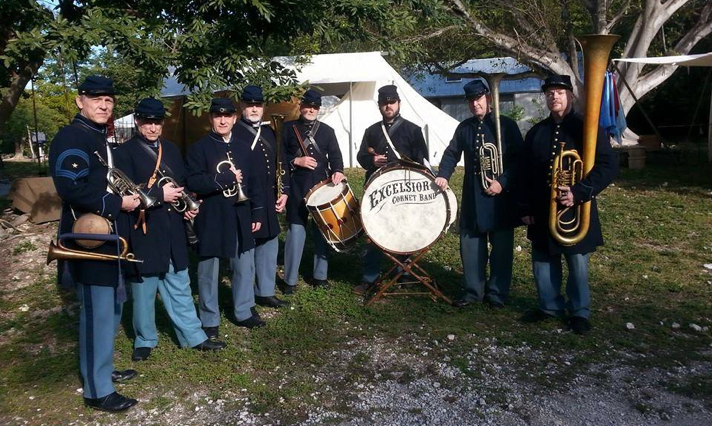 On February 6-8, 2015, the Excelsior Cornet Band performed in Key West, FL, at Fort Zachary Taylor, representing the 47th Pennsylvania Regimental Band. Five of our Upstate NY contingent were able to make the trip, augmented by several of our extremely capable Florida friends including Michael O’Connor, leader of the recreated Coates Brass Band/47th PA Regiment Band. Any excuse to go to Florida in February, even if we did have to wear wool! December 7, 2013: One new date added to the Schedule page. September 16, 2013: One new date added to the Schedule page. March 19, 2013: We have recently acquired six over-the-shoulder instruments--three Bb baritones, two Bb tenors, and an Eb alto--from eastern Pennsylvania. Four of them are part of a matched set. All were made by C. A Zoebisch of New York, prior to or during the Civil War. One tenor is currently playable; the rest will require varying degrees of restoration, from minor to extensive. Photos are now on the Instruments page. February 25, 2013: Three new dates added to the Schedule page. January 25, 2013: Two new dates added to the Schedule page. In December 2011, bandleader Jeff Stockham participated in the filming of Stephen Spielberg’s epic movie “Lincoln”. (Official website: http://www.thelincolnmovie.com; IMDB page: http://www.imdb.com/title/tt0443272/.) Jeff played tenor horn in a brass band which portrayed the US Marine Band of 1864. In addition, he supplied a number of rare original musical instruments (his tenor horn, a clarinet, snare drum, and bass drum) for the band’s use; and he provided other props including twelve original M1840 Musicians Swords and the Drum Major’s mace. The scene was shot in historic Old Town, Petersburg, Virginia, on December 19, 2011. Jeff is visible in a close-up shot of the band. The scene plays in the first few minutes of the film. On November 19th, 2012, the band reassembled to perform at Gettysburg for the 149th Commemoration of the Dedication of Gettysburg National Cemetery. Guest speaker Stephen Spielberg afforded the band the honor of posing for pictures and thanked us for being in the movie, exchanging handshakes with each member of the band. It’s an honor we won’t soon forget. September 21, 2012: Our musical colleague Garman Bowers, Jr., of the Federal City Brass Band, has announced the opening of his new business, GB Manufacturing. Those of you who have seen our beautifully restored original Civil War era drums are already familiar with Garman’s superb work. His new business offers complete of restorations of Civil War era rope tension drums, and is producing authentic reproductions of Civil War era drums, drumsticks, and accessories, as well as period-correct chairs, music stands, instrument cases, and equipment crates. Please be sure to visit GB Manufacturing’s Facebook page: https://www.facebook.com/GBManufacturing. 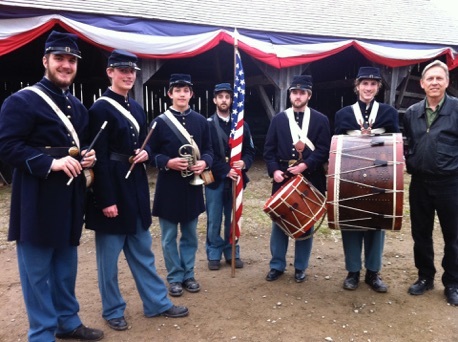 June 5, 2012: Bandleader Jeff Stockham has just returned from Fredericton, New Brunswick, Canada, where he spent a week as a musical consultant on the set of the upcoming Civil War movie Copperhead: The War At Home . Directed by Ron Maxwell, whose films Gettysburg and Gods & Generals are legendary among Civil War aficionados, Copperhead: The War At Home tells the story of an upstate New York family ripped apart by war, of fathers set against sons and daughters, of a community driven to an appalling act of vengeance against a man who insists on exercising his right to free speech during wartime. Copperhead: The War At Home is a timeless and deeply moving examination of the price of dissent, the place of the individual amidst the hysteria of wartime, and the awful cost of war. The film opened nationally on June 28, 2013. The production company rented our Blodgett & Bradford bass drum, Edward Brown snare drum, and Boston Musical Instrument Manufactory “Band Model” B-flat cornet for use by the drum corps, in a scene where the village’s young men march off to war as new recruits. Jeff was responsible for the historical accuracy of the music, instruments and the performance of the drum corps. Jeff also played the cornet on the soundtrack recording for that scene. 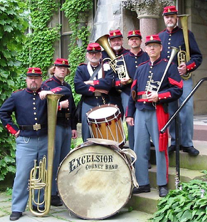 November 11, 2011: The Excelsior Cornet Band can be heard on Michael P. Ryan’s CD “CASHTOWN”, which won the 2011 Syracuse Area Music Award (SAMMY) for Best Rock Recording of the Year. The band played on the four tracks that comprise the “Suite Jenny Wade”. We are proud to have been a part of this outstanding project. Congratulations, Mike! October 10, 2011: Our Boston Musical Instrument Manufactory “Orchestra Model” B-flat cornet has been restored by Mark Metzler and will make its performance debut at our October 15 concert at Hartwick College. Photo on the Instruments page. September 15, 2011: We have just purchased a beautiful Henry Lehnert “Centennial” model valve trombone. Photo on the Instruments page. January 26, 2011: Our OTS E-flat cornet by Eduard Baack has been beautifully restored by Mark Metzler. Photo on the Instruments page. November 29, 2010: We recently took delivery of two freshly restored 19th-century drums: a very large and impressive Mexican War era bass drum from Maine, and a beautiful rosewood snare drum by John C. Haynes of Boston. Both were restored by Garman Bowers, Jr. of Fairplay, MD. Photos on the Instruments page. September 10, 2010: We have added an Items For Sale page to the website, with currently available instruments and items of interest. Be sure to check it out! accompanied by the Federal City Brass Band. 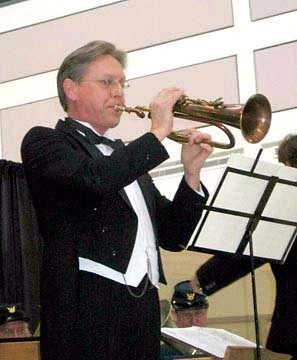 March 16, 2008: Bandleader Jeff Stockham won First Place in the 19th Century Historic Division of the 2008 National Trumpet Competition, held at George Mason University in Fairfax, Virginia. Jeff performed Joseph Kuffner’s Polonaise for Keyed Bugle in the final round, accompanied by the Federal City Brass Band. “Lincoln” director Stephen Spielberg poses with “Lincoln’s Own Marine Band”, including Excelsior Cornet Band leader Jeff Stockham (second from left) at the 2012 commemoration of the dedication of Gettysburg National Cemetery. Jeff Stockham with the drum corps, on the set of the movie Copperhead: The War At Home, at historic King’s Landing near Fredericton, New Brunswick, on May 31, 2012.